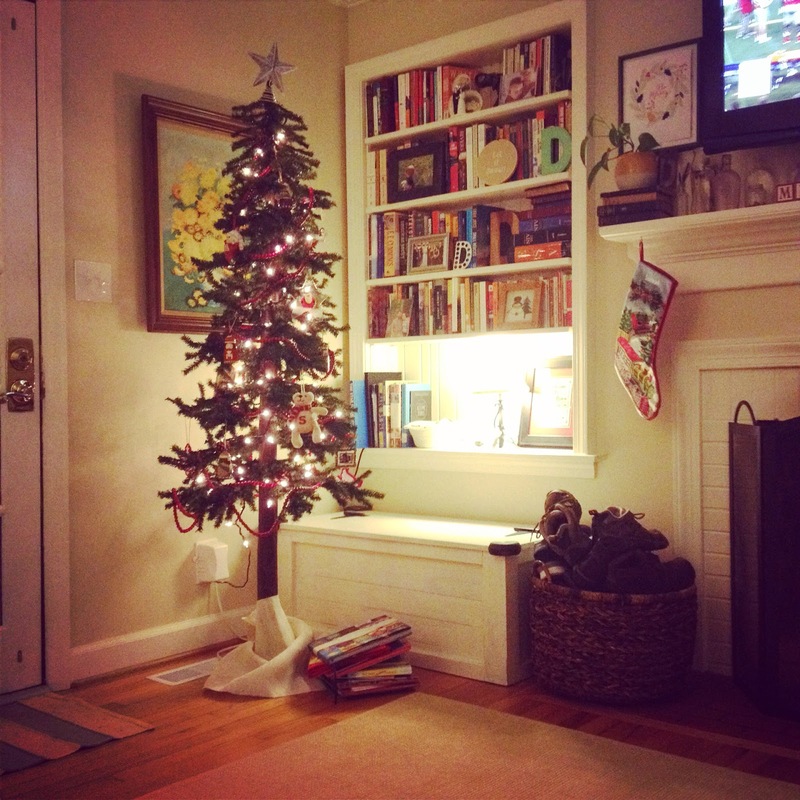 I had a mini-meltdown this weekend regarding decorating for Christmas, and I'm blaming Pinterest. It's no secret I love and hate Pinterest. And I think, deep down, we all kind of feel this way. From spending way too much time on Pinterest, one thing has become clear. There are some folks out there that are really good at pretending to be perfect. One of my favorite blogs did a feature on how they take their blog pictures. Hint - not with their iphones. They listed their favorite camera, lenses, accessories, and lighting. That's right, every amazing picture is taken with those umbrella-type gizmos you see at a photo studio. Well, no wonder their photos are 100 times better than my mine taken in poor lighting with my smudgey phone camera. Now, this blog remains my favorite because they do share real-life photos with giant piles of laundry and a sick full of dishes (although the pictures are still really good!). They also frequently remind readers of the giant piles of junk just out of site. But I digress. I know perfect is an illusion on sites like Pinterest. But it doesn't mean it doesn't get me down. So back to my point - this weekend. I realize now that I'm just not the greatest holiday mom. But going into the weekend, I had such high expectations of family decorating time. I even bought tiny marshmallows for hot chocolate and stuff to make cookies (well, a bag of cookie mix, whatever). But in the midst of burning cookies, tantrums, failed Christmas crafts, and an overall lack of Christmas spirit, I kind of lost it. There were tears involved. It was ridiculous. Why do I do this to myself? Why do we let Pinterest ruin our holidays like that (I'm assuming you've done this too)? My hubby gave me a talking-to (in a totally caring and justified kind of way) and we hit restart on the day. We didn't get a tree this year since we'll be traveling, but we did make a trip to the tree lot for some greenery (I would not call it magical as we got wet and had to drag Sam to the car screaming after we wouldn't let him take home the giant plastic frosty), but it was pretty great none-the-less. We put out the nativity scene, put up our little tree, hung Sam's stocking, and called it good. Because it is good. Seeing Sam's eyes light up when he saw the tree the next day, reading Away in a Manger 100 times before Sam will fall asleep, and watching him fall in love with the tiny baby Jesus from my childhood nativity set, now that's magic.